The USS Titan continues its exploration of the Beta Quadrant while the recent Andorian incident continues to serve as a major problem for the crew of the Titan as they are in the midst of a risky investigation, exploring a dangerously unstable region of space. Michael A. Martin's novel, Fallen Gods, really hits the ground running! On the planet Ta'ith, its two tribes, the Deconstructors and The Preservations, are under threat from the nearby Vela Pulsar. But the two sides have different views on how to deal with the impending crisis. The Preservations believe that only the technology left behind by their ancestors, The Fallen Gods, can save them while The Deconstructors believe that technology is the source of their problems and the destruction of all technology will save them. All this information is unknown to Captain Riker and the crew of the Titan. Instead, the crew find themselves waiting for the arrival of one of Starfleet's new slipstream vessels, whose orders are to remove all the Andorian crew members on board the Titan and 'reassign' them. Of course, Riker doesn't take kindly to these orders but this proves to be only the beginning of his problems as an Andorian warship arrives before Starfleet and demands that the Andorians are sent to him. The scope of Fallen Gods expands quickly and the reader quickly discovers two disconcerting truths. One threatens Tuvok and his sanity and the other takes place in the corridors of the Andorian ship. The former presents a real threat for Tuvok's life as well as a potential gain and the latter presents a new threat to the now fragile Andorian/Starfleet relationship. Martin does a good job of describing the planet of Ta'ith and it was easy to imagine some crew of the Titan and species of Ta'ith, trapesing across the wasted surface. But it is not just the new aliens that Martin weaves into the plot beautifully, his treatment of the Andorians is top notch. Fallen Gods wraps itself up nicely in the plot and leaves us some nice threads left hanging to explore in the other books from the range. 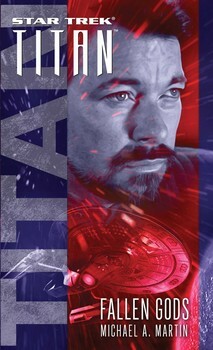 Out of all the Star Trek books I have read, Fallen Gods is easily Martin's best solo work for the series and if you are looking for a book that mixes action and moral implications well, then this book and the range is for you. After all, that is why we love Star Trek because it mixes action with moral implications so damn well!